Boat Pkg. Length Width Beam Bottom Transom Side Dead Approx. Approx.Pkg.Wt. Hull Max. Max. # of Fuel Livewell Length (length on trailer) on Trailer Width Height Depth Rise Dry Hull Wt. (boat, motor, trailer) Gauge H.P. Wt. Cap. Persons Capacity Dimensions & Capacities 20'11" 26'6" 101" 95" 72" 25" 28" 15° 1645 3115 .125 200 2000 8 29 G 16" x 62" 65 G 19'10" 24'10" 92" 92" 64" 20" 24" 10° 1210 2230 .100 150 1300 4 21 G 15" x 45" 33 G 18'10" 23'10" 92" 92" 64" 20" 24" 10° 1190 2025 .100 115 1250 4 21 G 15" x 45" 33 G 17'10" 23' 92" 92" 64" 20" 24" 10° 1080 1865 .100 90 1200 4 21 G 15" x 45" 33 G 17'10" 23' 92" 92" 64" 20" 24" 10° 1080 1865 .100 90 1200 4 21 G 15" x 45" 33 G 16'10" 21'6" 92" 92" 64" 20" 24" 10° 755 1380 .100 70 1100 4 6.6 G port 15" x 45" 33 G 16'10" 20'8" 75" 71" 52" 20" 21" 3° 740 1475 .100 70 1000 3 11 G 10" x 23" 10 G 15'10" 19'10" 76" 71" 52" 20" 21" 3° 700 1350 .100 50 750 3 6 G 10" x 23" 10 G Notice to Consumer: The performance information and data contained in this Catalog is approximate and subject to many different factors and variables. It is provided as a guideline only and should not be relied upon as representative of actual performance. Your boat's performance may be different than the information contained in this Catalog due to various factors, including your boat's actual weight, wind and water conditions, temperature, humidity, elevation, bottom paint, boat options affecting wind/water drag and/or boat weight, and operator ability. 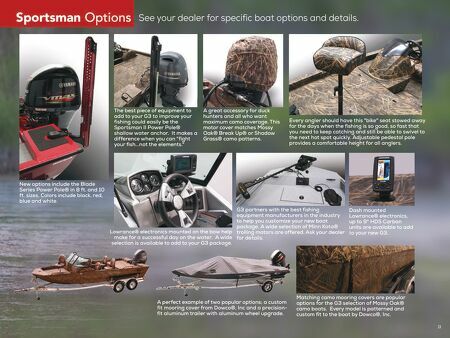 Please confirm the specifications and performance data on your specific boat/engine combination with your dealer prior to purchase. Please also keep in mind that the data contained in this Catalog may or may not have been performed using Yamaha PowerMatched components. Yamaha and G3 Boats reserve the right to change the specifications and performance data of these boat & motor packages without notice. 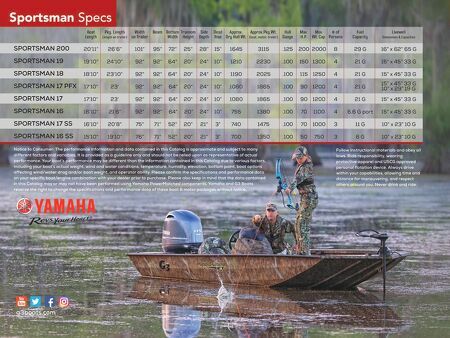 g3boats.com SPORTSMAN 200 SPORTSMAN 19 SPORTSMAN 18 SPORTSMAN 17 PFX SPORTSMAN 17 SPORTSMAN 16 SPORTSMAN 17 SS SPORTSMAN 16 SS 12 10" x 29" 19 G Follow instructional materials and obey all laws. Ride responsibility, wearing protective apparel and USCG approved personal flotation device. Always drive within your capabilities, allowing time and distance for maneuvering, and respect others around you. Never drink and ride.